When companies start, business owners and entrepreneurs grow and develop the strategies, strengths and plans that ensure them stepping a head, getting their companies bigger and more profitable. In their view, success is only sustained when they focus on the customers and their satisfaction. They want to build remarkable strategies and long-term plans to grow and flourish their businesses. Training staff also ensures long term success in terms of dealing with the customers and managing day to day business activities. The rules of the business are wholeheartedly followed to gain the competitive advantage and stay ahead of competitors. When things go wrong, people’s fingers pointing out the person at fault start flying all over the room. Who is to blame? Who is responsible for the failure? Ensuring that everything is in place does not guarantee success. Affirming the managers’ jobs in devising new compliance regulations and instructions that should be followed by staff members contribute to more non-compliance and an increasing turnover. Most Customers’ engagement programs fail to engage customers and turn their attentions to whatever is being sold. Technology itself has been the barrier not the catalyst. Marketing is failing faster than ever to make people tick, make better and smarter buying decisions. Each company clearly sets broader objectives that foster profitability, staff retention and customers’ engagement. Everyone believes these objectives are the keys to creating the leading organisations of the future. To their surprise, the results come later very staggering. Here are the 20 causes that hold you back from reaching success. Here the 10 things that increase profitability. Here are the 3 steps to outsmart your competitors. Bad strategy and planning, bad execution, untargeted marketing campaigns, untrained management team and outdated IT systems are also the most repetitive reasons that add up to “who is to blame” list. This list constitutes the hallmark of behind door long meetings that aim to reveal the secrets of the unavoidable failure and correct the nosedive. The only reasons businesses fail is simply because their leaders set them to fail. A business is just a structure that does not fail. Do businesses fail due to the constant changes in the market, the economy and the customers’ taste. All these factors combined trick the business leaders and expose them to risk but they are not the main causes. Businesses do not fail, leaders push them to the edge. Understanding the roots of the problem, changes the response. We know now who is to blame when the business fails and stumbles. Misunderstanding and misapplying entrepreneurship and leadership are the causes of the problem. Entrepreneurship is not starting a business that sells valueless products to people. And leadership is not managing people and delegating tasks on time. There should be a thorough and careful reconsideration and redefinition for these crucial subjects: entrepreneurship and leadership. Thousands of articles and books have been written about this subject, but most of them failed to guide and provide the groundwork for effective application. How to inspire a collective action towards building something great if people are confused about the definition and the rules of the game? As stated in a previous article, entrepreneurship and leadership should not be blindly pursued, they should be first understood. This is the key challenge. Most entrepreneurs and leaders fail because they are purposeless. And purposeless leaders create purposeless businesses, hire purposeless people and make purposeless and valueless products. The business environments that the purposeless leaders build are discouraging, dis-empowering and unsocial which prevent people from fulfilling their potential and going the extra mile. It is every man for himself. When uncertainty looms, the whole business stalls. Who is to blame when this happens. When the markets tumble, the odds are the purposeless leaders would take drastic measures to fix the problem. Fixing the problem permits them to lay off people, restructure and transform the business to solve the whole situation. The absence of leadership has made redundancies, layoffs, downsizing, resizing, and restructuring the norm in the business world. Sadly, most leaders fail to root out the main cause of the problem because they are the problem. Who is to blame? The market conditions, irrelevant products, IT systems, bad execution or the purposeless leaders? You be the judge. Why is the case different for purposeful leaders? Most people admire great leaders because they truly inspire them. Why do they inspire them? Because they stand for something great and sacrifice their time and energy in their pursuit to achieve the great cause. It is through the cause that the business leaders advocate in focusing on the solutions to the problems facing people, satisfying people’s true needs not desires and making jobs more meaningful. These are the outcomes of a great leadership. When the markets tumble, the odds are the purposeful leaders would come together with their people to fix the problem not to lay them off. The power of a good leadership is a great purpose, and the power of a great purpose is the strength of togetherness within the group to face the challenges and overcome them. The purposeless leaders are mainly concerned with benefiting themselves regardless of the consequences. The purposeful ones are genuinely concerned with benefiting people and empowering them. In the era of purposelessness, confusion, manipulation, failures, bankruptcies and bad leadership practices have worsened the situation for all. 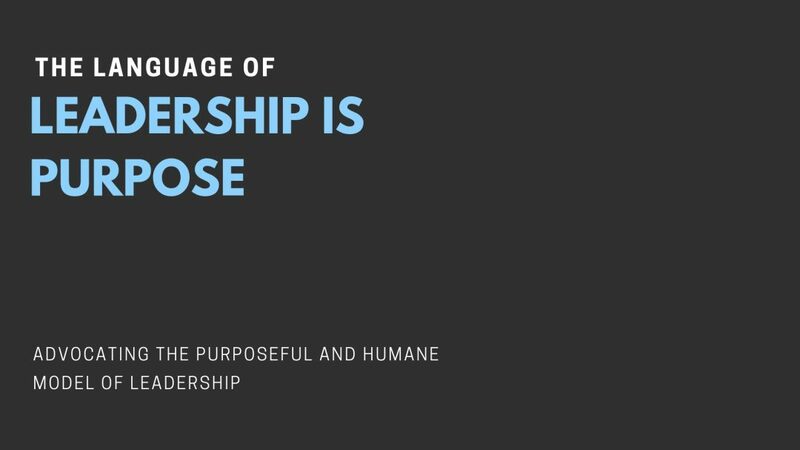 The challenge today for leaders is not to put purpose at the heart of the business but to make it the heart of the business and how that turns the era of purposelessness into an era of purposefulness. Posted in Business Posts.Tagged business, companies, Entrepreneurship, fail, leaders, leadership, purpose, purposeless, whycompaniesfail. Next Post The concept of customers are always right has retarded the business thinking for a long time.